It seems the 1930s are hot again. First Christina Aguilera released her homage album "Back to Basics" that included big band era sounds. 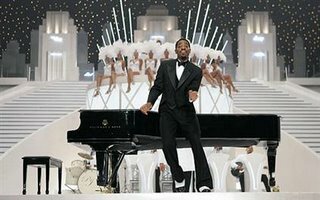 Now, hip-hop duo Outkast stars in the movie Idlewild, set in depression era Georgia. The result is a lively, entertaining excursion into a past Hollywood seldom allows us to witness, a past inhabited by black folk. This is not the white man's story where African-Americans inhabit the periphery, nor is it the idealized story where everyone, white and black, coexists happily side by side. Idlewild is a story about two best friends with nothing in common but music. Rooster, played ably by Big Boi, is the small time gangster who grew up running moonshine at his father's knee. Andre Benjamin plays Percival, the eccentric son of a widowed mortician whose one love is the piano. As adults, Rooster and Percy both perform at The Church, a dance club which feels like a brokedown version of the Cotton Club where African-Americans are not just the entertainment but the audience as well. The requisite gang war ensnares Rooseter, while a starlet finds her voice with Percy's help. The climax draws the two stories together, changing everything. The bizarre juxtoposition of hip-hop and the Depression seems somehow to work, probably because of the clothes. Big Boi and Andre look like they could exist in either era, thus easing the transition to the hip-hop sound. All in all, Idlewild is enertaining despite its problematic pacing, which drags at times. The musical numbers will have your toes tapping, but between numbers the clocks seem to assume a plodding pace. The highlight of the film, at least in terms of characters, is Taffy, a foul-mouthed, drunken singer played by Macy Gray. She begins her number thus "How y'all feeling tonight? You know I don't give a damn." Somehow I can just imagine Macy doing just that at her own concert, and I would still pay to here her raspy sound. The cd that was released to accompany the movie is a strange melange of movie snippets, skits, and solo performances by Andre and Big Boi where Outkast only performs four numbers. Incorporating elements of Depression era music into their own unusual musical repertoire makes for a different sound, that is going to have a hard time getting air time on the radio, especially for Andre, the more musically adventurous of the duo. Even some of the best their stuff, tracks like "When I Look in Your Eyes" and "Makes No Sense at All" and Macy Gray's "Greatest Show on Earth" are just too different. Big Boi's numbers are more likely to find an audience as they fit the more traditional mold of hip-hop sound. "Morris Brown" is bound to be a hit, and interestingly is the one chosen to play on Lettermen where Outkast appeared recently. Maybe the best thing on the Idlewild cd, besides Andre's creativity and chutzpah, is Janelle Monae. Her sound is pure and tight, both sultry and innocent at the same time. Vibe.com describes her sound as "a chic fusion of R&B, pop, soul, and rock with a retro sheen." Discovered by Big Boi, she teams with him on "In Your Dreams," but she just brings down the house in "Call the Law" with both Andre and Big Boi. Possibly the best track on the cd, Janelle swings with a style beyond her years. Too bad they didn't include her numbers in the movie.